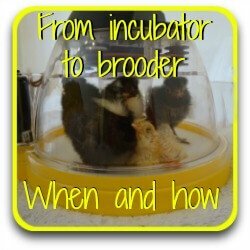 Baby chicks: when can they leave the brooder? 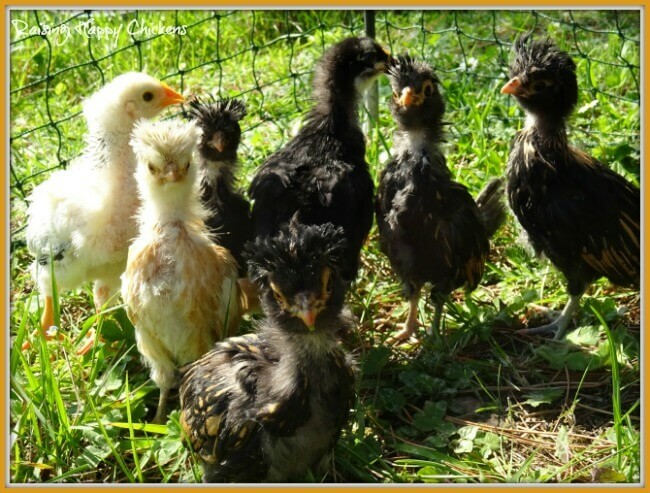 Baby chicks: when can they leave the brooder for the wild outdoors? 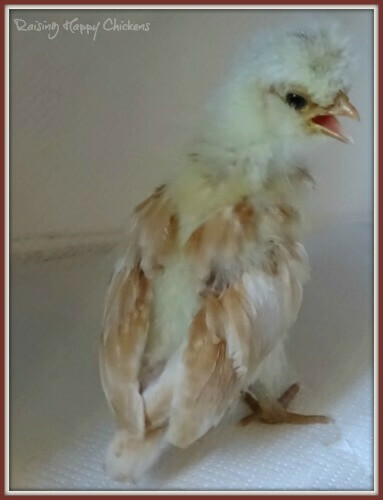 So your cute, fluffy little chicks are growing up and getting bored in the brooder. It's time to fly the nest. But are they still too young to go outside? When is warm enough? How do you keep them safe? And how should they be introduced? It happens to us all. Those cute, fluffy babies start to grow. They outgrow their first brooder, so you give them a bigger one. They try their wings, so you put some mesh over the top of the big brooder. They start to smell, so you move them from the house to a basement or garage. But sooner or later, they need to go outside - for everyone's sanity. 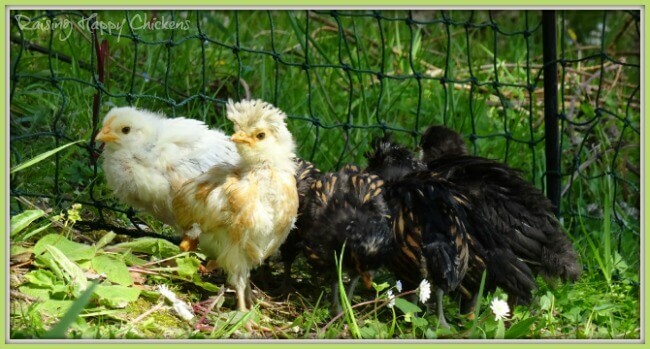 If you have other chickens who have been together in a flock, you will need to introduce the chicks very carefully to the big girls (and boys). 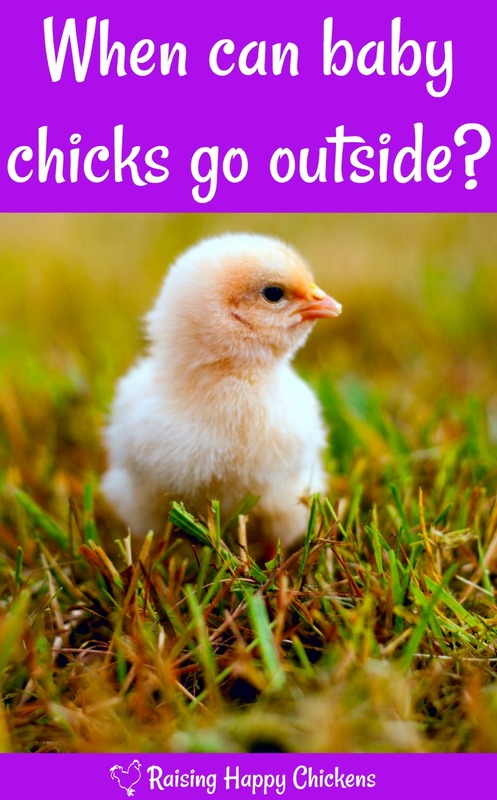 But before you even start to think about integrating the chicks with the flock, it's a good idea to get your chicks used to being outside at all. After all, it's a big, scary world for a chick after the safety of the brooder. First things first : At what stage is it safe for baby chicks to go outside? A 4 week old chick. Wing feathers are developed but her body is still covered in down. This will depend on the time of year you hatch and what the weather is like in your area. If babies are raised by a mother hen, of course, they're outside from day 1 - but they always have their mother to run back to for instant warmth when things get a little chilly. If you've hatched eggs in an incubator, you'll need to take some precautions to make sure the young ones don't get chilled. So the first piece of advice I have is : wait until they're at least four weeks old before you introduce them to the outside world - and only then if the weather where you are is warm. If there's snow on the ground, don't do it. By that stage they will have some feathers, which are their main way of keeping warm, but wing feathers develop first and the rest of the body is likely to be largely covered in down. And down does not retain heat. This means they won't be capable of maintaining heat for very long at this stage. They will usually be fully feathered by about week 11 - 12. Some of my baby chicks, outside for the first time. You can't just take babies outside and leave them to fend for themselves. They are extremely vulnerable. So think through your own situation. Do you have somewhere for them to go? Grass is best, but it needs to be cut short. 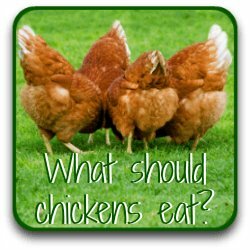 Long pieces of grass can cause impacted crops even in adult chickens. Are there predators around? If so, how can you protect the babies? Can you stay outside with them yourself? How are you going to contain them? Even very small chicks will wander. They need to be able to explore, but to be safe at the same time. Do you have any way for them to get water while they're outside? They can't survive for long without it. Do you have somewhere they can retreat if they feel frightened? Chicks who aren't used to outside noises will become spooked very quickly. Providing them with a safe place is a kindness. Babies will take shelter if they become anxious outside. Thirdly : how long should they be outside for? When my babies first venture out I generally leave them outside for no more than a couple of hours. That's enough time for them to explore, start to get used to strange noises (which will help them a lot when they finally go into the Big Girls' run), and not get chilled. But as ever, use your common sense and your knowledge of your own flock. Do they look as though they're puffing up their feathers? They may be getting cold. Are they peeping in that frightened way you will have heard before? If so, what's scaring them? Can you help or do they just need to go inside? Most importantly, don't leave them by themselves. You need to watch them. Take advantage of it - what could be nicer than spending a couple of hours in your garden on a lovely warm spring day watching the antics of your babies? 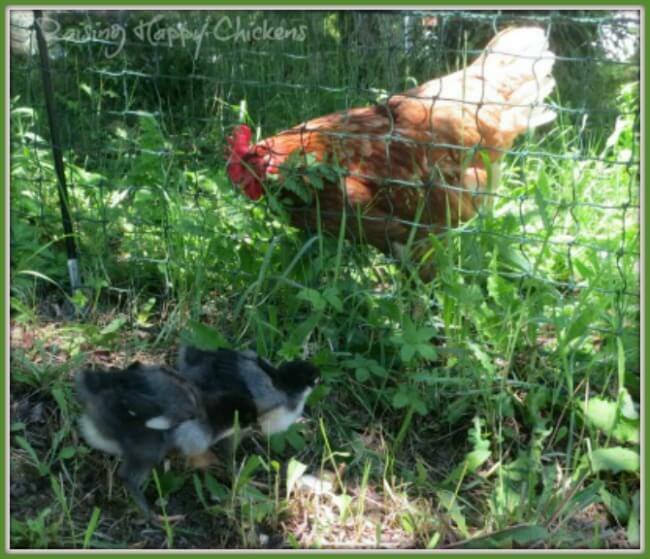 Baby chicks experiencing their first time outside are fun to watch. 5 tips to help your planning. 1. Buy something to contain them. You can rig something up yourself fairly easily using wooden poles and chicken wire. I use a portable netting fence which I can make bigger or smaller, and move around as I want. It's initially a bit fiddly to put together but once you've got all the posts in place, it works well. I don't use an electric netting because I personally believe it's too harsh. At the bottom of the netting the holes are only 5cm x 5cm, so small enough to contain chicks after about 5 - 6 weeks old, depending on the breed of course. If you're putting chicks in it before that be aware that they can escape! It's nice and high so I also use it at times when introducing newbies to the adult flock, when I need to keep some hens separated from others - or when I need to protect my plantpots from hens intent on dust-bathing in them! However, be very aware : netting like this will keep chickens in but it will not keep predators out. It's not designed as a safety device, it's designed as a way of containing. This is the system I bought which is available at Amazon UK, but not Amazon USA. The USA netting is electrified, but for small chicks you have the option of simply not attaching the electric wiring. 2. 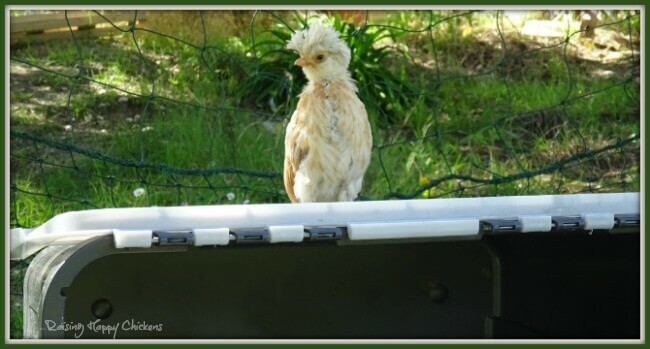 Use your small brooder box (if you used one) as a place of safety for your chicks - they're used to it, which is important while they get used to so many different sights and sounds outside. If you didn't use a brooder box any cardboard box will do. 3. Think like a chick! They are curious creatures. They love exploring and they always seem to think the grass is greener in someone else's part of the garden. Be careful, for example, where you put your 'place of safety' box. The first time I did this, one of mine decided to use it as a springboard to help her escape. She was mauled by a dog (because I also broke the golden rule and left them outside while I went to do some household jobs) and I nearly lost her. So learn from my mistake. Place the brooder in the centre of the area you're using, not close to the fencing! My escape artist extraordinaire! Kris the Polish chick was nearly killed when she used the box as a launch pad. 4. Beware of dogs and cats, not just foxes and coyotes! 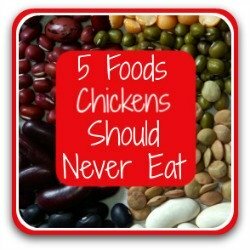 Remember that domestic animals are not necessarily a friend of chickens, especially little ones. At the very least, they will be tempted to 'play' with those squeaky balls of feathers. At worst they may see them as lunch. It's not just your own animals you need to be aware of. Neighbouring dogs will be attracted by the smell; neighbouring cats will be attracted by the noise. Both will kill. 5. Use the time to 'bond' with your chicks. 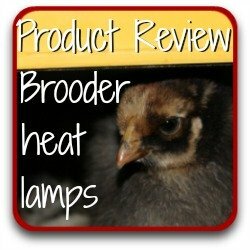 You can't climb into the brooder with them! So use the opportunity while they're outside to sit in the run with them. Take a book. Enjoy the outside. And most importantly, get to know them. It will pay dividends when they're older and much, much bigger. 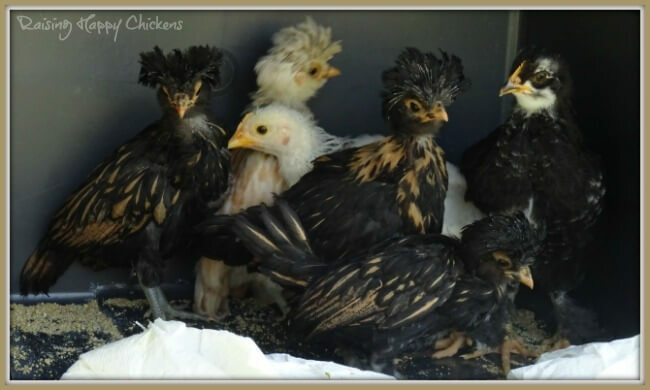 Here are some of my baby chicks enjoying time outside in the sun. These littlies were five weeks old when they first went outside - the temperature had just been too low to allow them out before then. But as you can see - they loved it! You can also see that this was before I learned the lesson about my chicks being able to use their 'place of safety' box as a launching pad to escape from the netting. Lesson learned - the hard way! If you've found this page useful, please let me know by clicking the button below. Thank you! If this page has been helpful to you, you may find these links useful too. Just click on the pics to go to those pages.